Ganesh Herbal Udyog is highly specialized in the manufacturing of Nutsedge Essential. With the assistance of our experts, we manufacture Cyperus Oil implementing latest production techniques. We fabricate Musta Essential Oil from natural ingredients that assure our clients of our credibility. 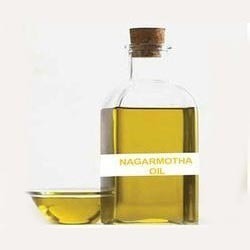 Our Nagarmotha Oil is widely used in the making of soaps, cosmetics, perfumery products. Besides this, we are also planning to enter the field of cultivating aromatic plants like palmarosa, khus, lemongrass and patchouli. We ensure availability of essential oil in varying quantities suiting to the needs of customers. We have also priced our oil reasonably low that suits the preferences of customers. Today, we are reckoned as one of the most principal Musta Essential Oil Manufacturer and amongst the famed Suppliers from India.